Appearance: Pours a deep ruby-brown. When held up to the light it looks almost red. Thin head with ok lacing. Smell: Lots of things happening here! Off the bat I smell malts, brown sugar, cherries, plums and figs. Slight alcohol smell. Initial Taste: Wow! Very, very flavorful. Strong caramel malts and those dark fruits we smelled earlier definitely make themselves apparent. Taste ends with slight alcohol finish. Thoughts: All I can really say about this beer is, wow. Never has a beer surprised me as much as this one. The only reason I grabbed this beer from the shelf was because of the name and the fact it comes in a can. It seems that very few beers (in the US) that come in a can are worth drinking, well this is the exception to that rule. The flavor of this little canned beer is strong and powerful. Personally I could not drink more than one or two of these little flavor bombs. I do however recommend everyone try one though. I can almost guarantee you have never tasted anything so flavorful…as appealing (or unappealing) as that may sound. 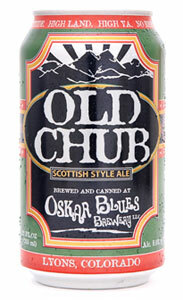 I will definitely be trying the rest of the Oskar Blues lineup asap. Look for the reviews!